We top off a trip to Osaka with a couple of days in Kobe. The city is perched between hills on one side and a huge working harbour on the other. 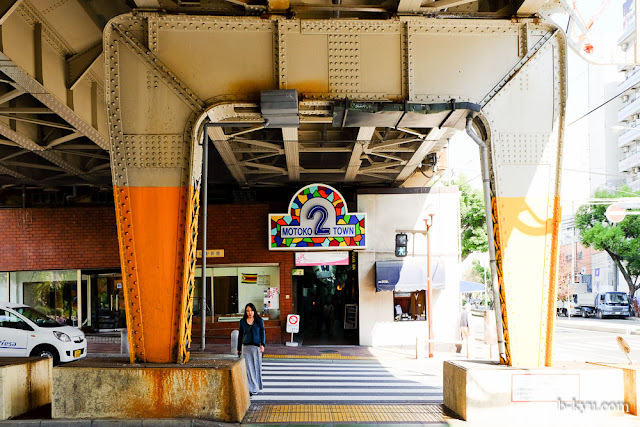 If you are coming in by local train there are a number of small stations that make up different areas of the city, the local Kobe station is a little far away from the bigger downtown area of Sannomiya. 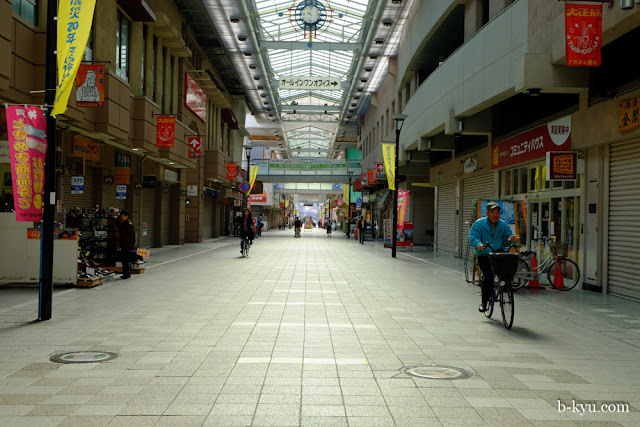 Even the shinkansen JR Shin-Kobe station is a little way out of town from the main busy part of the city but there are connectors to bring you in. 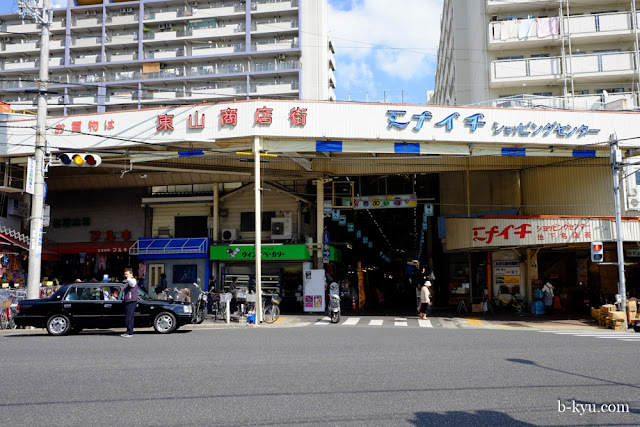 We first fall in love with Kobe when we find Motoko Town. 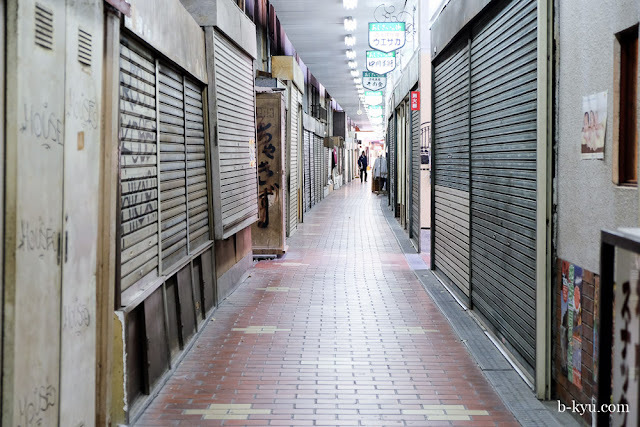 Motoko Town is a skinny passage of shops that runs underneath the railway starting at the west gate of Motomachi JR station, divided into 6 numbered sections between cross streets. We start at the low rent end, marvelling at the junk shops so junky that they're still selling 1980's word processors with tiny little green screens. As the section numbers get higher the scene gets more hipster - there's some tiny groovy bars, galleries, burger joints etc. In the middle there's a couple of excellent secondhand record shops, Japan is great for vinyl hounds. As we walked through the sections the piped through music shifted from Prince, to Fleetwood Mac and then... wait, what's that? Stone Roses! "She Bangs the Drum" makes for a mind bending smile inducing soundtrack walking through a Japanese otaku wonderland. 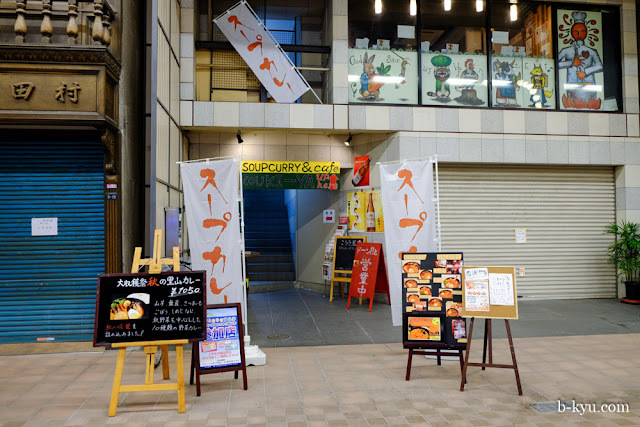 Walking down from Motomachi JR station toward the harbour is Katagiri, a little resto/bar with a sign promoting some healthy looking food for lunch, our b-kyu cells were screaming out for vegetables after a week in Osaka. This cutesy little place was squeaky clean and upbeat, run by ladies with a penchant for a few French decorations and light jazz. The food was light and fresh, with a little protein in the middle. And my god, salad. If there's one thing we miss when we travel it's salad. 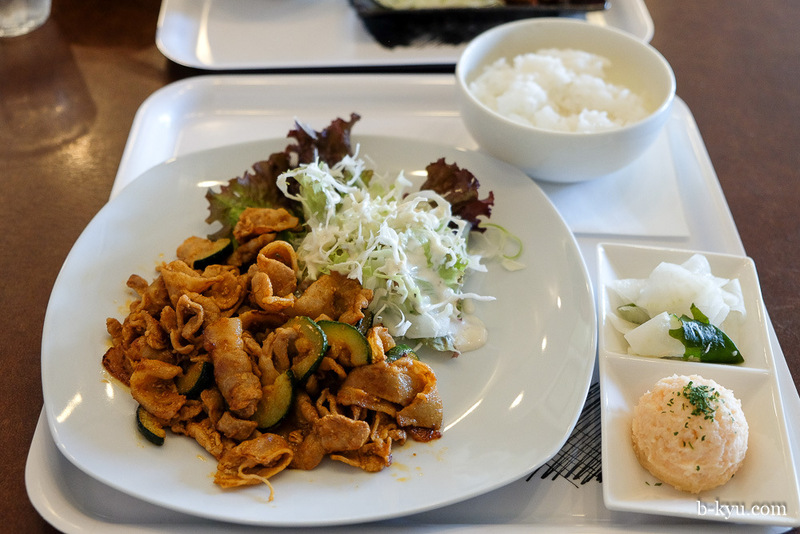 The lunch meals were only available as sets, and there were only two to choose from. Lunch number one was chicken shio, small thigh pieces cut with the skin on and grilled with salt. The frilly outer edges were burnt and crunchy, the best part about keeping the skin on. Lunch number 2 was sweet and sour fish, a sauce with enoki and shredded carrot on tempura cooked fish pieces. 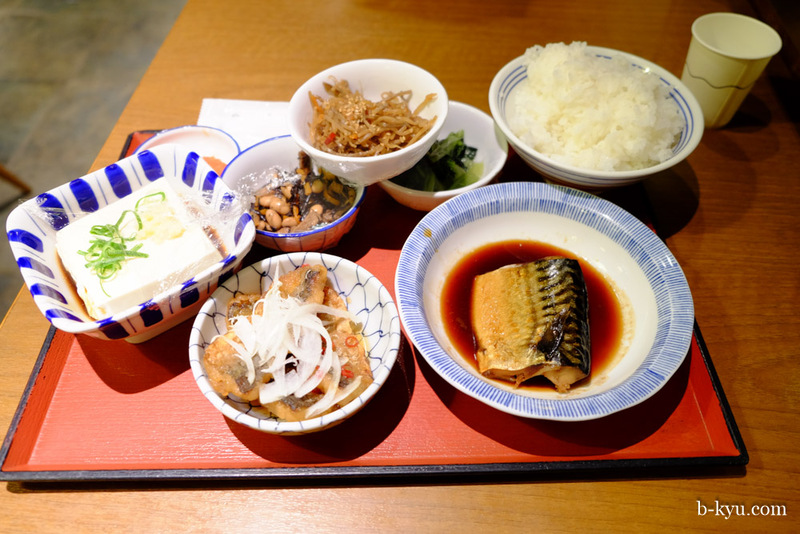 Both meals are served with a small green salad with a ponzu dressing, a small mayo salad with noodles, carrot and cucumber, small pickles (carrot and radish), three small fishy tofu puffs, miso soup and a bowl of red and white rice flecked with corn and small beans. Salad and good health, ah! 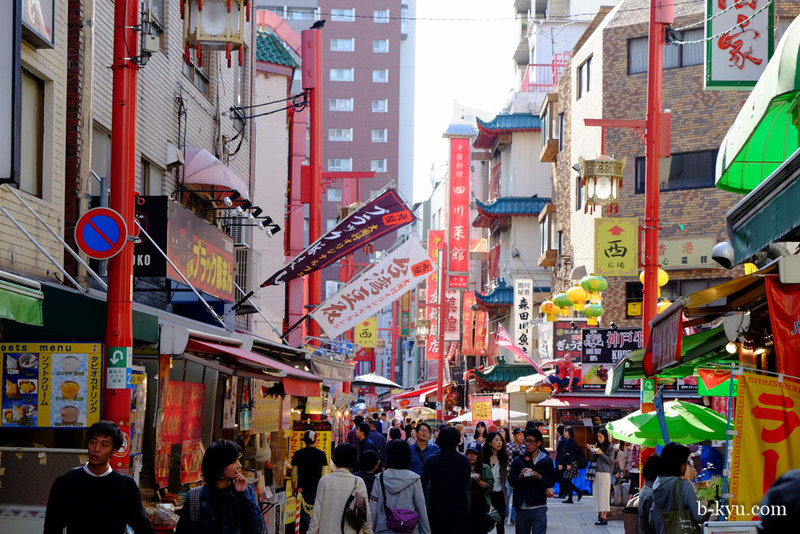 We looked forward to a Chinese feed in Kobe's famous Chinatown, Nankinmachi, but it's hella gimmicky. We guess folks from Osaka day trip up here to walk up and down the road, and package tourists are dropped off by the busload at one end and are scooped up at the other. Our rugby mad bar buddy from Fukushima mentioned he goes to Kobe for a Chinese feed but we felt it was all a bit over the top without the interesting food we expected. 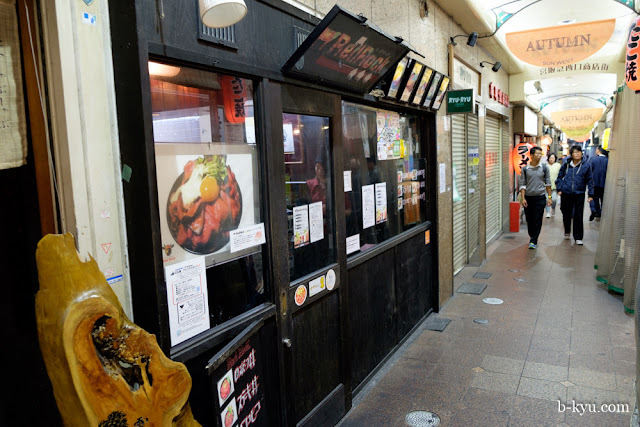 Sure there's probably some good restaurants in Kobe Chinatown but most of it is geared to high volume tourism, with second-rate looking snackies lining the streets. Most of the other tourists seemed to be snacking on steam buns, fried sticks and croquettes before getting back on the bus. 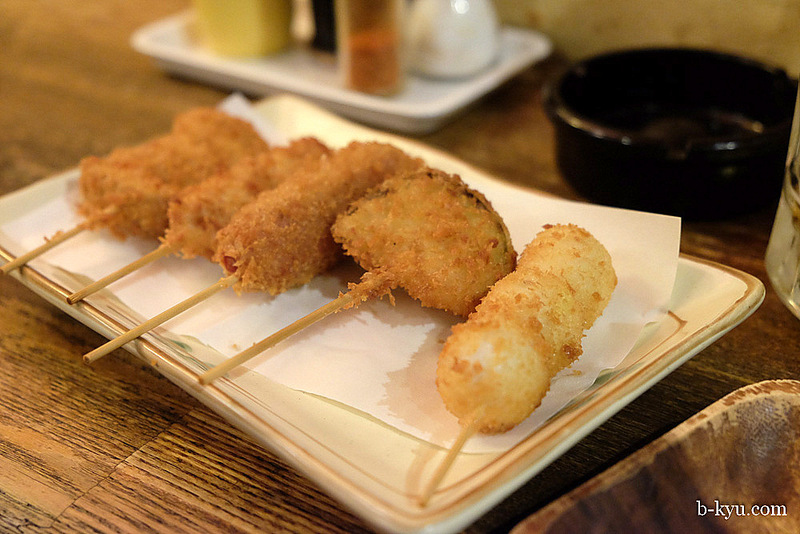 We tried some croquettes at Kobe Croquette along the strip, they're mostly lots of deep fried panko crumb excitement around some fillings. 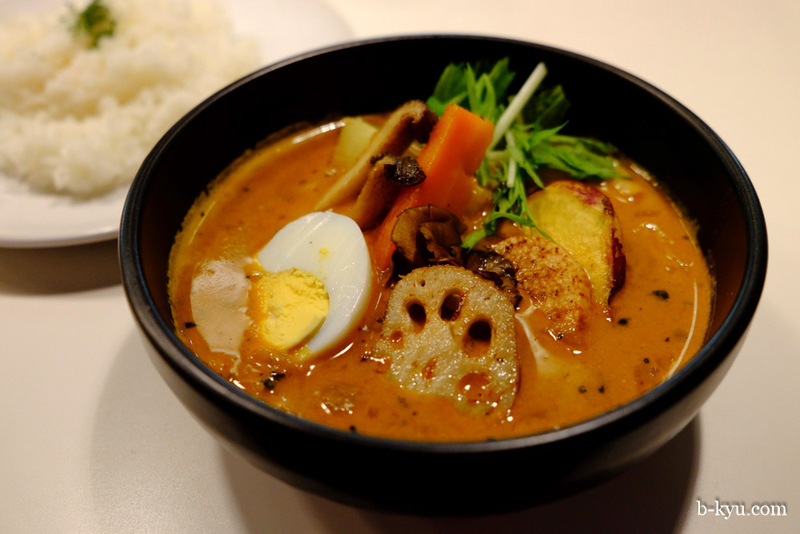 We spent a lot of time strolling through the covered walking streets and struck paydirt along the way: soup curry! 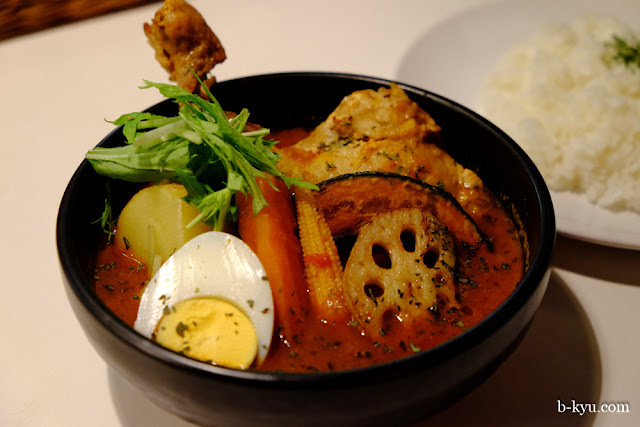 We went nuts on soup curry in Sapporo a couple of years back, it's hard to find the good stuff outside of Hokkaido. We did find it in Tokyo once but it was pale comparison to Sapporo soup curry. But this here is ring-a-ding kick arse soup curry. Soup curry is unlike the goopy Japanese curry both in texture and flavour, it's like a mild Indian style curry flavoured soup with big country style hunky chunks of meat'n'veg. There's a 'choose your own adventure' in the soup base and heat levels, we go for a tomato base here around a medium heat level. 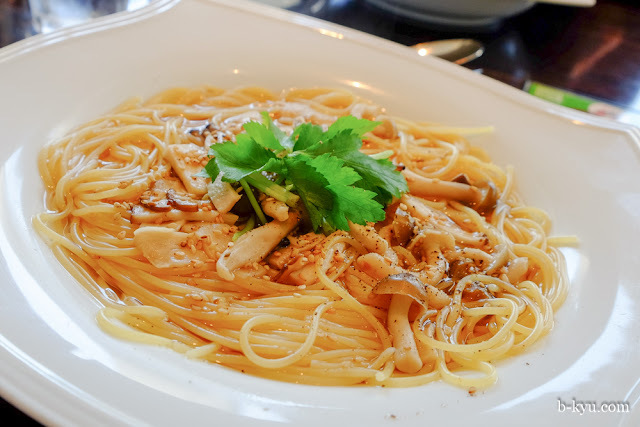 Our other option is a coconut base, which makes it more like a laksa. There are no noodles in this dish, rice is served on the side so you can either dip spoonfuls in or eat the rice as you please. 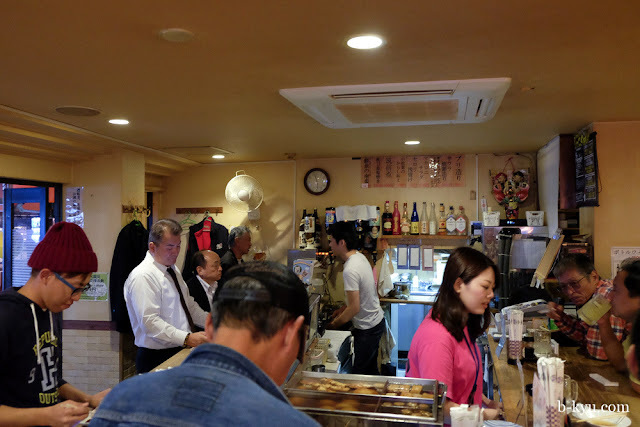 The restaurant had no English name, look for it along the Motomachi Shopping Street. The one thing Alison has to see in Kobe is the Gigantor statue, found on the south side of JR Shin-Nagata station. 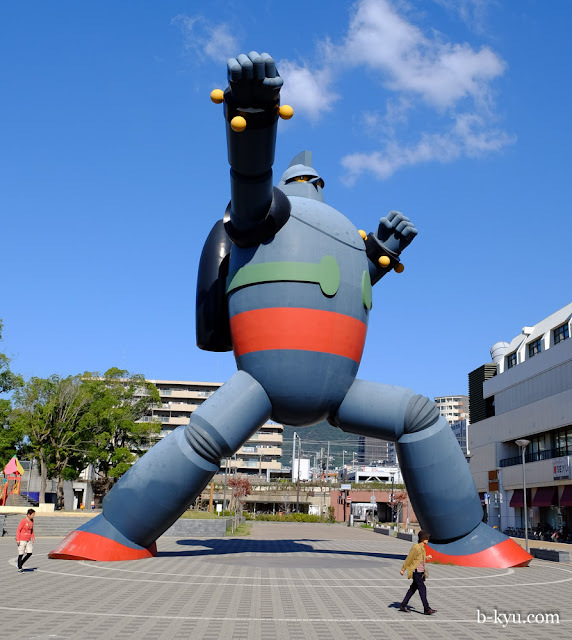 We learn his Japanese name is Tetsujin-28-go, which is heaps cooler than Gigantor, which is still pretty cool all the same. The statue is impressive, particularly after the pissy Godzilla statue in Tokyo. 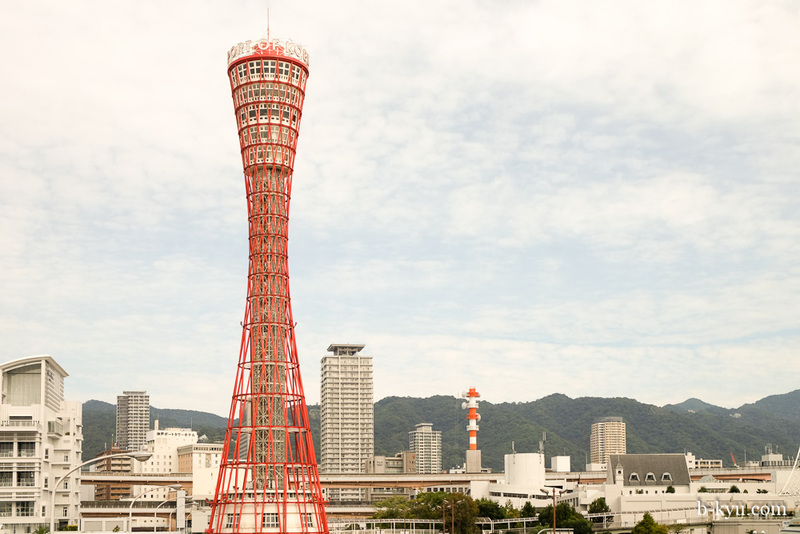 The 18 metre high statue was erected by the people of Kobe to celebrate the rise of the city after the devastating earthquake of 1995. 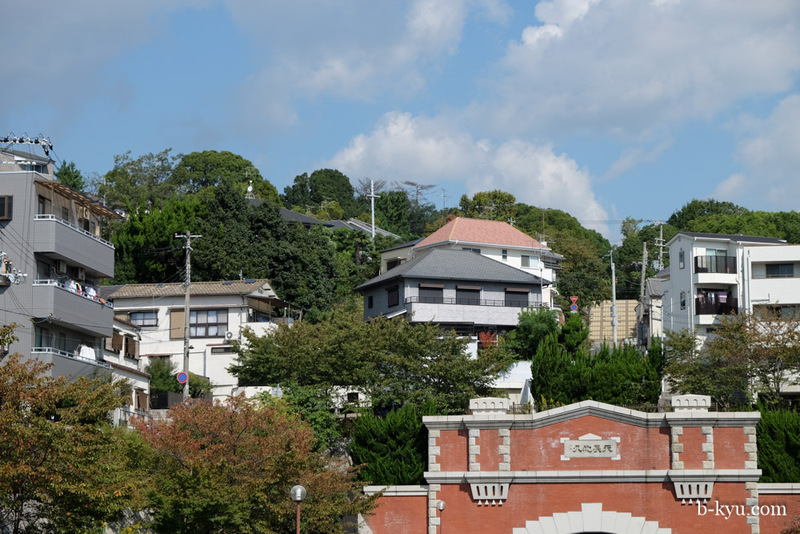 Mitsuteru Yokoyama, the creator of the classic sixties cartoon, was born here. We celebrate Tetsujin-28-go at a nearby noodle bar. 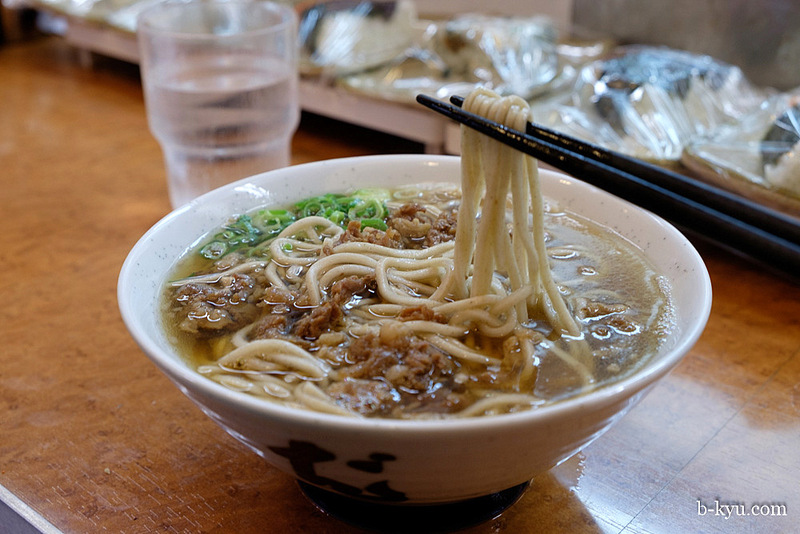 This simple bowl has added beef which also flavours the broth. 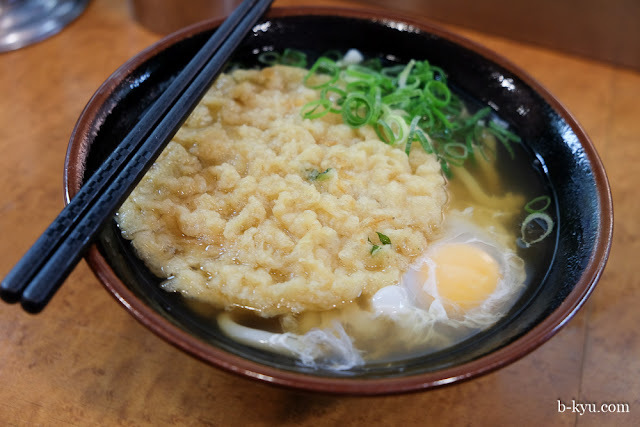 Breakfast noodle soup is healthy until we add the fried stuff, you can't go wrong with a shot of prawn tempura on top. 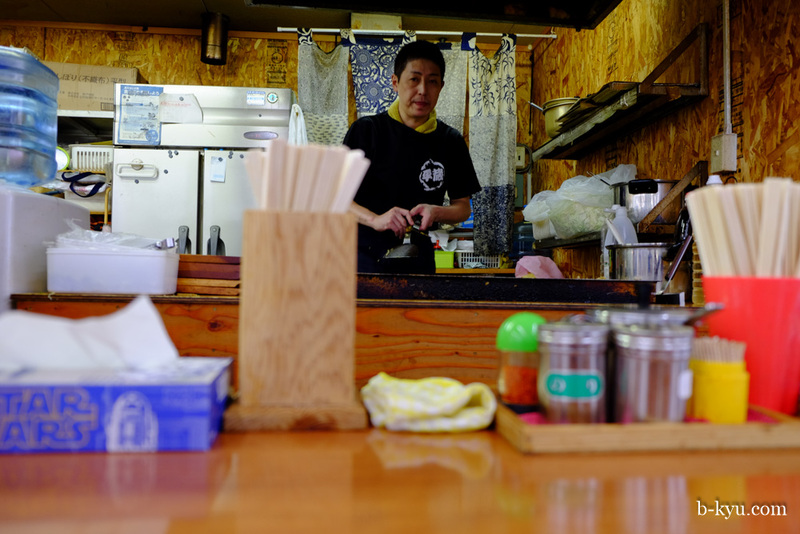 There's always a quiet delight to these small noodle bars, especially as we are usually hitting them just after the salaryman rush. Our joy at standing at a bar, quietly (or noisily, as the case usually is) eating our noodles, is only surpassed by the sheer happiness of lifting the bowl at the end and drinking up every last bit of the broth. From Gigantor at Shin-Nagata we decide to walk back all the way towards Kobe central. There's a real low rent side to Japan here that we love, these quieter suburbs that had their heyday in the 1980's, so too the inhabitants. This area was once a more central part of Kobe and a lively entertainment district but was hardest hit in the earthquake and doesn't seem to have risen back yet. Or maybe it was always like this? The rents are cheap around here. 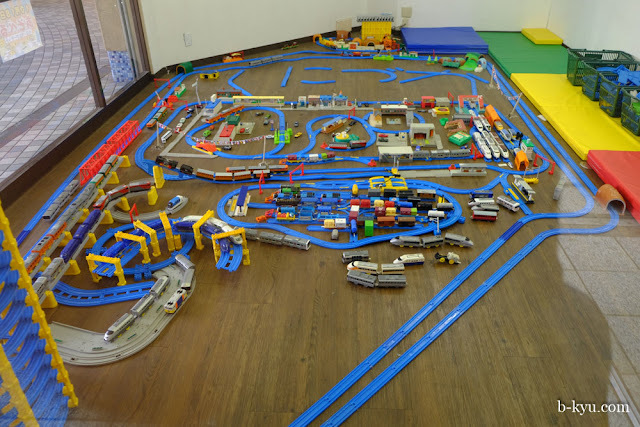 In one closed shop we find has a plastic train set on the ground, that's it. We're not sure if it's kiddies or adults that play here. 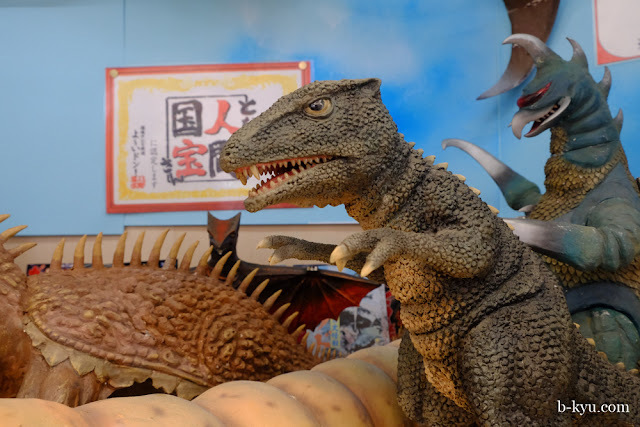 Down one arcade wall is a cool home made Japanese movie monster window box display. All the greats are here, lovingly recreated as not quite to scale models like Gigantor. Alison has fun trying to name as many as possible, including the smog monster, Mothra, Gamera, Rodan and even baby Godzilla. A childhood of bad movie watching has some uses, these used to be on all the time in afternoons or late night but you hardly see even a peep or a roar nowadays. If you have wondered where the origins of the term B-Kyu come from, these movies are part of it. On our walks we usually try and keep off the main roads so we can poke around back streets and peek into peoples lives. We detour up into the hills and get overtaken by bunches of schoolkids on the steep parts. It's certainly not low rent up here. Nice houses. Tree-lined streets. Great walking. The area around Nagata was a wonderful small neighbourhood with little stores and local business. After walking through the quiet of parklands and cemeteries we head back down the hill and things get low rent again. 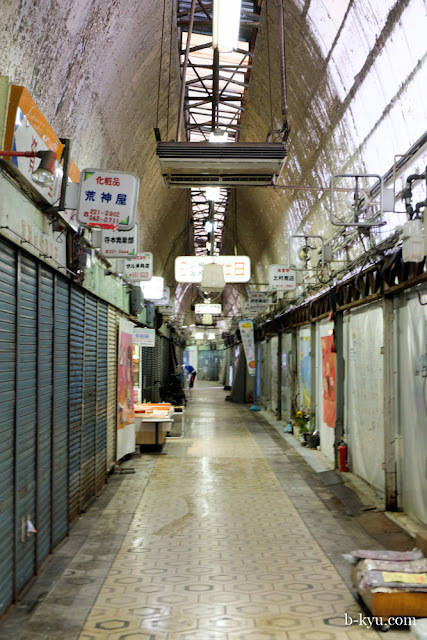 We find this wonderful old school produce market full of tops old aunties and uncles. 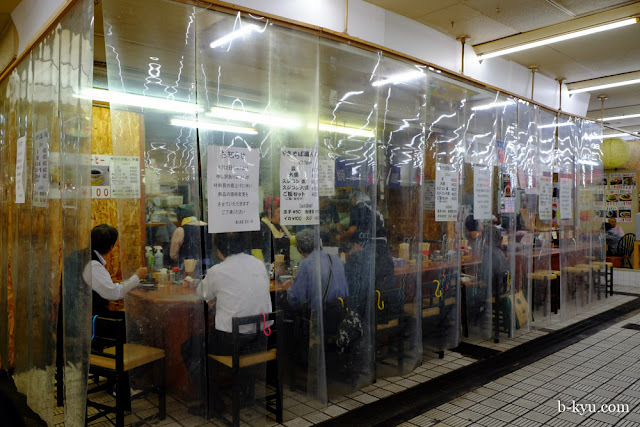 For lunch we open up the flaps and head into this busy little stall. 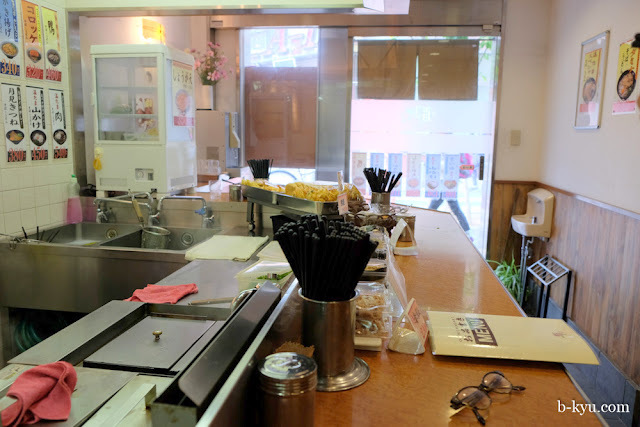 There's a system here where you order over the counter and sit back and watch the chef cook up heaping piles of yakisoba with a precision and practice that gets everything mixed just so. No mess, no fuss. 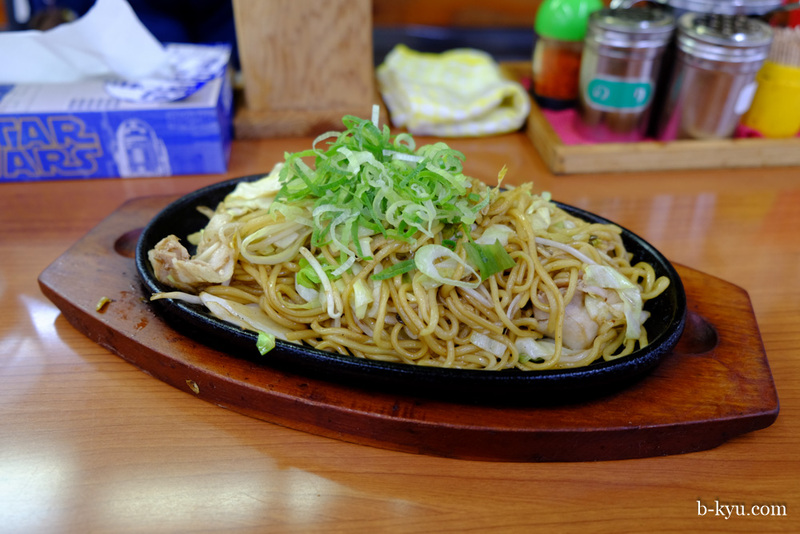 We go for yakisoba - fried noodles - one of those simple dishes that is wonderful when it's done right. It's also pretty much what they only did. This is a small size, filled with chicken and cabbage. 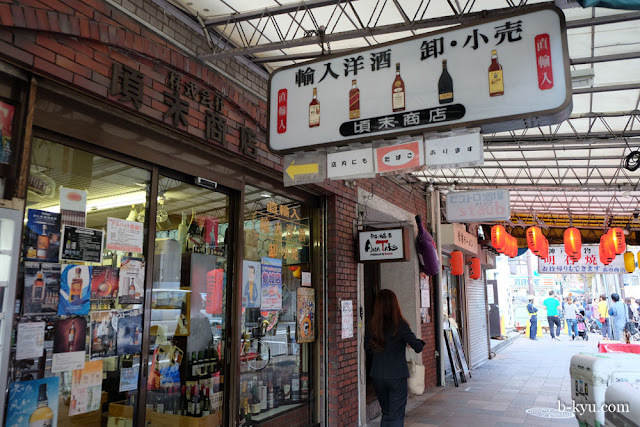 We stumble upon a new attraction in Japan for us: specialist liquor stores. 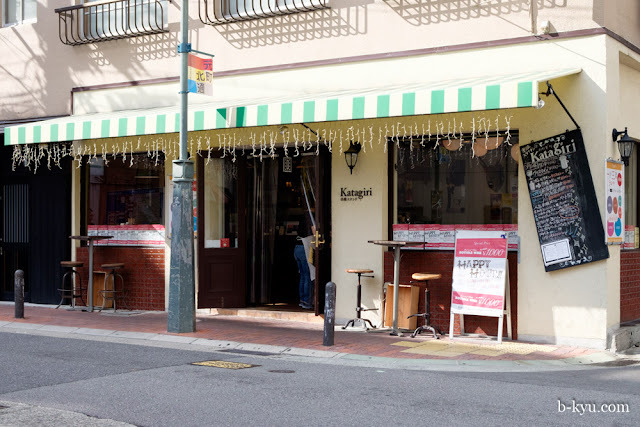 Korosue is on the east side of Motomachi station and is worth crossing the tracks for. While they weren't the chattiest of chaps to us, their range does all the talking. Alison stocks up on boutique Japanese single malt, versions of which you are unlikely to find at the duty free store or you would pay a Gigantor sized price for a single glass back in Sydney. Shawn ogles the rare bourbons. There's more varieties of the dark brown liquid we love than we have ever seen in one spot and the prices were incredible. We looked into splashing out on a meal of Kobe's famous beef, but the whole scene in Sannomiya looked tourist taxed. Besides, the Kobe beef you get in Kobe will be the same Kobe beef as you get in Osaka, or Tokyo, or Fukuoka. Instead we settle on Red Rock, a beef bar we stumble upon in a walkway under the railway line. 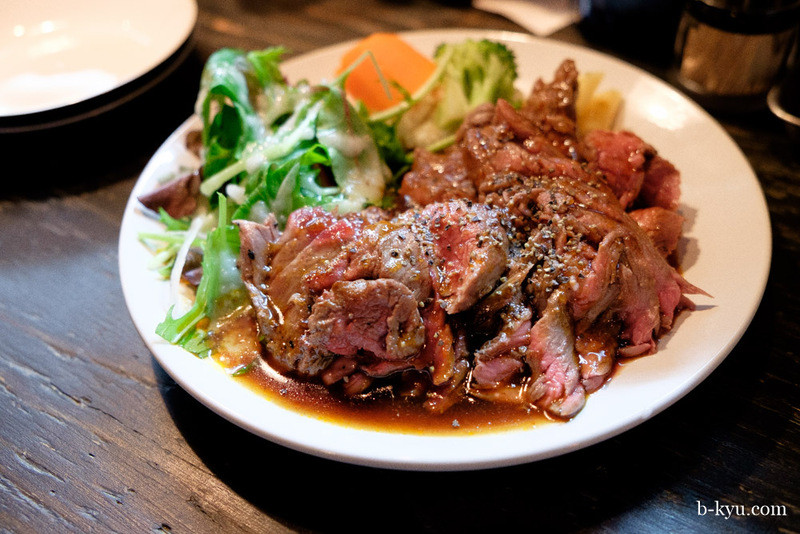 We just made up the term beef bar, which sounds too good, expect to see it in Surry Hills soon. Red Rock is pumping! We are lucky to be squeezed in right at the end of the bar. 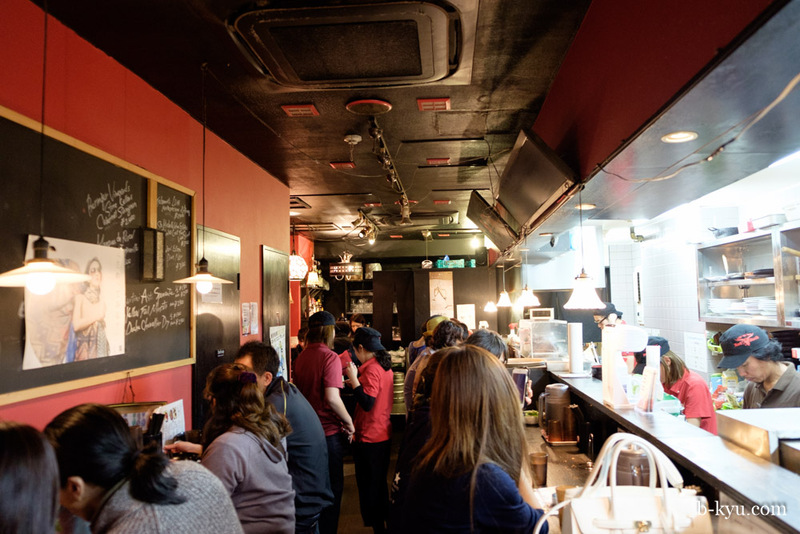 We love the after work busy-ness of Japanese bars, it's great to watch people with many an excuse to eat before going home or going out for more afterwards. Not speaking Japanese we do our best to point and order what we see others eating, we get a beef bowl alas with no rice like we wanted. However the beef that gets placed in front of us is insane, charred on the outside and pink and oh so juicy. 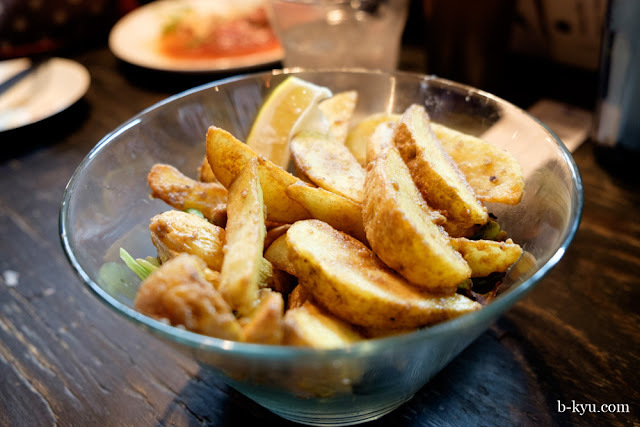 To go with the beef are these anchovy chips - wedges of potato covered in an anchovy sauce, one of those magic dishes we'd love to bring back home. The uber saltiness of the sauce and the slight fishiness of the anchovies make magic with the beef and the juices, much like Worcestershire sauce on a steak. These and a couple of chu-hi's and we are done. Another old school noodle bar for breakfast. We just love these places to bits. The glamourpuss auntie boss gives Shawn some stick for saying 'ohayo' instead of 'ohayo gozaimasu'. Manners! 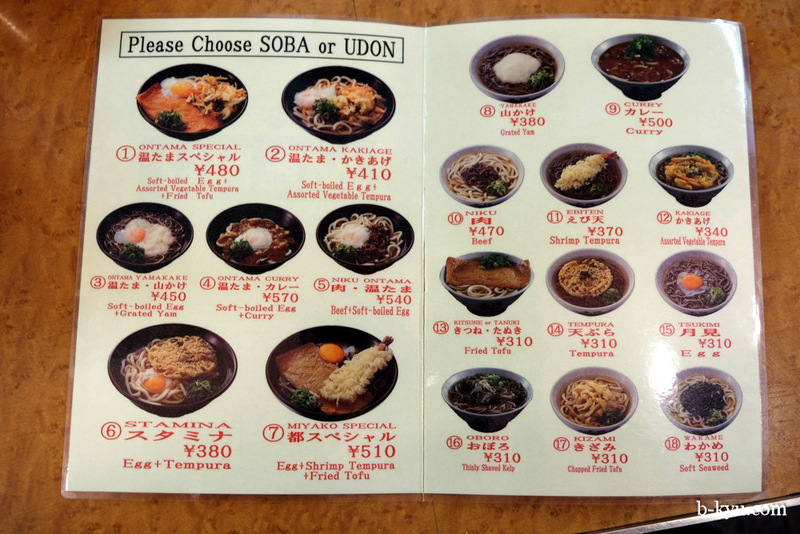 This noodle bar has an English menu, the first we've ever seen in one of these joints, we usually just press a random button on a ticket machine, sometimes there's a picture if we're lucky. Living the dream, living the dream. 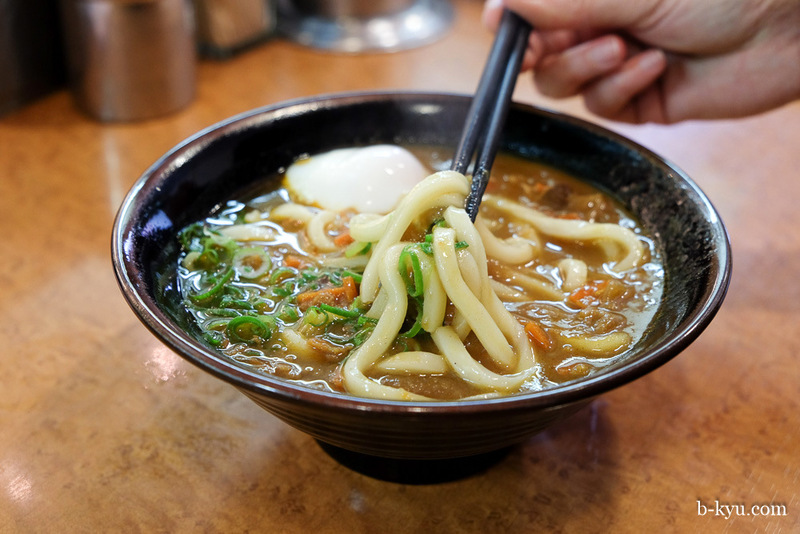 Alison goes for soft-boiled egg and curry noodle noodle soup for breakfast. The curry wants to go all down the front of her top, this stuffs needs careful eating at the start of the day. Pro tip: don't wear pale colours eating curry noodles. 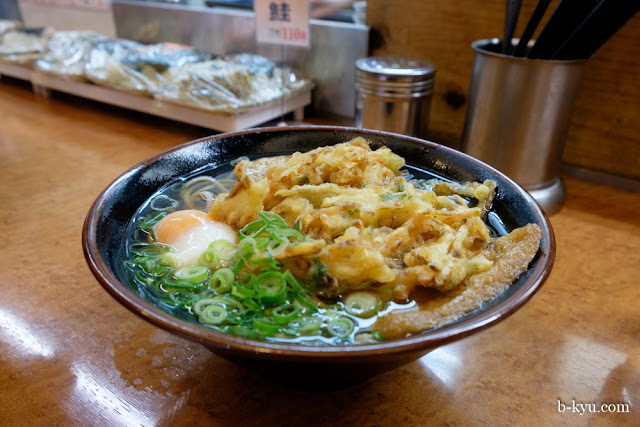 Shawn goes for the 'Stamina' noodle soup with the manpower of tempura and raw egg. What a man. For today's adventure we catch a train to the sake brewing area. A walking tour of the sake breweries is the thing to do here. 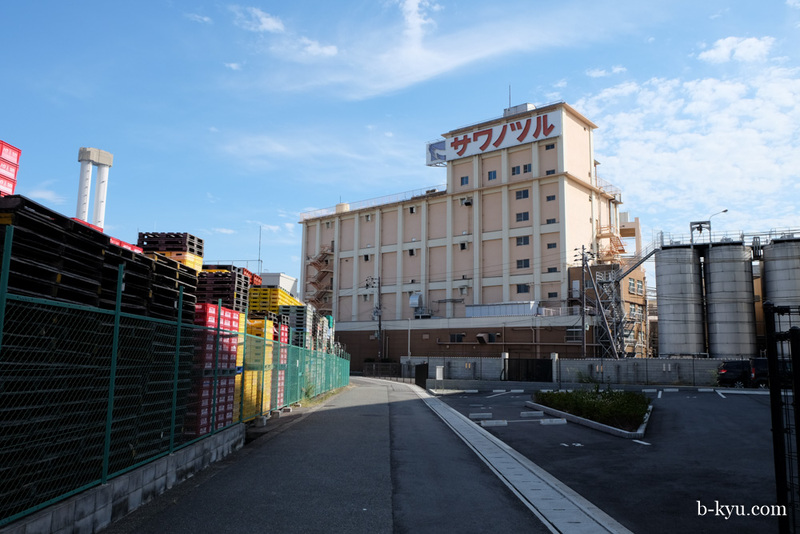 We envisioned a day walking through fields, over dainty creeks into charming little family owned breweries, hopefully getting tipsy, lost in a forest, and saved by a Totoro. It's a tad more industrial. It's all concrete and factories fringed with suburbia. We couldn't find half the breweries on our map. Some were just wholesalers uninterested in a pair of gormless foreigners unlikely to spend anything. 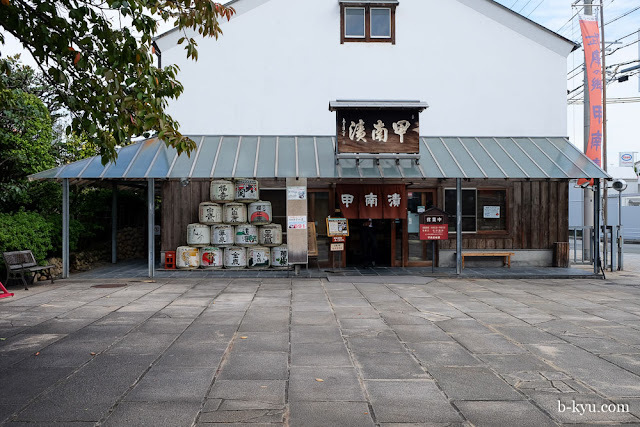 The best we could manage was to visit a couple of the sake museums. These were like little 'Sake World' tourist attractions attached to larger breweries. 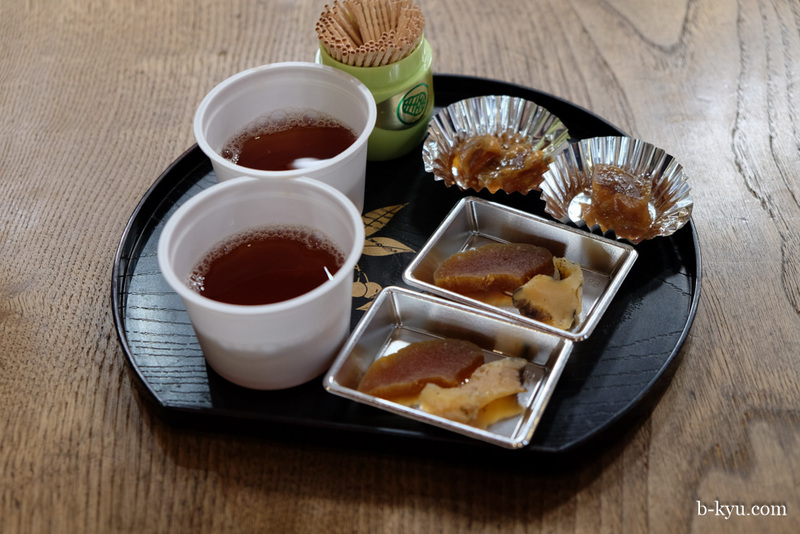 These were edumaticational and fun, with sake samples. All museums should have alcohol tasting at the end of the tour. As well as breweries, there's a number of shops selling food made with sake byproducts, such as this pickle shop. This is set up for tourists but hey, free pickles and tea. We walked out with a couple of bags of pickles, mighty fine stuff. 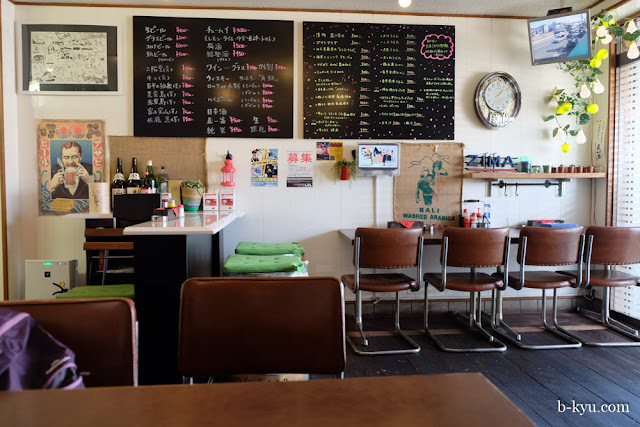 We end up semi-lost in nowhereville suburbia and drop in to this little resto for lunch after a super nice lady beckoned us in from the street. We never listened to our mothers about strange people luring you in for a trap, and gladly so. It turns out the folks are half Philipino which makes for interesting food, brown as it may be. We can never go past an offer of a rissole. There were a few noisy local sake brewery workers digging in as well, mostly into the cold fish which was possibly a better option. There was a grab it yourself system from a large fridge or a set menu. 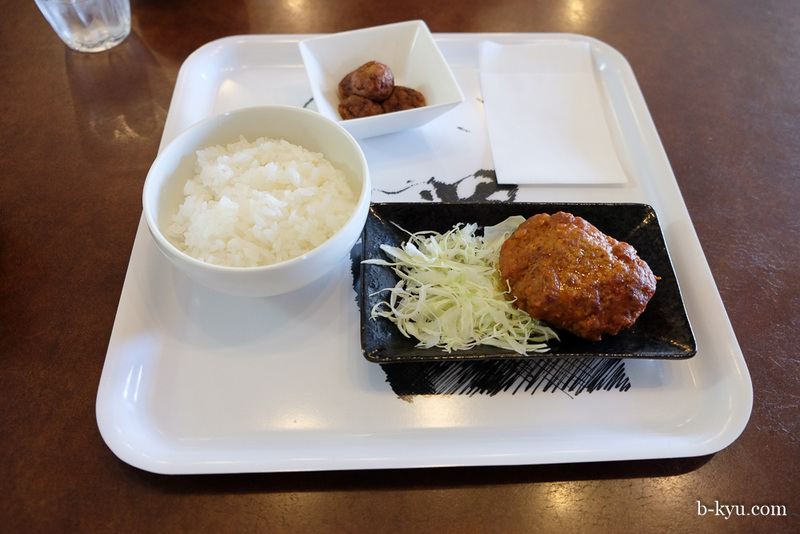 The lunch set of chilli pork was a winner. 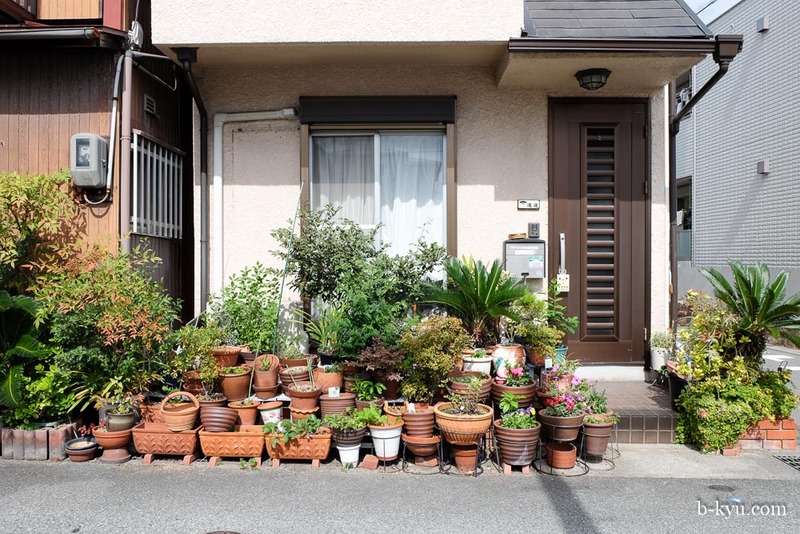 Things we love about Japan #768: the little potplant gardens outside folks' houses. These range from the ornate and thriving to the ramshackle and barely alive. There's an art to half bonsai-ing plants so they're miniature without being prissy. We walk back a few kilometres from the sake area to the hills up behind central Kobe and along back down the walkway from Shin-Kobe. We don't meet a Totoro but we do meet the next best thing. As we wind through the hills we see the most wonderful thing. Long lines of primary school kiddies walking home unsupervised, no parents, no teachers, they just stick in a group and break off when they get near home. Apparently teachers and residents keep an out for the kiddies, and unsavoury characters, but otherwise they are trusted to walk home themselves. It's how life should be. In the west these kiddies would have been picked up by helicopter mums in armoured four wheel drives. Back down the hill off to the side of town things get beautifully low rent again. This decaying arcade is a ripper. We found an older one which was dark, brown wood panelled, mysterious, barely inhabited and very unwelcoming. If we walked inside we would have ended up in plot of a Murakami novel. We find a little pub that screams our name in Kobe's small but energetic nightlife area. 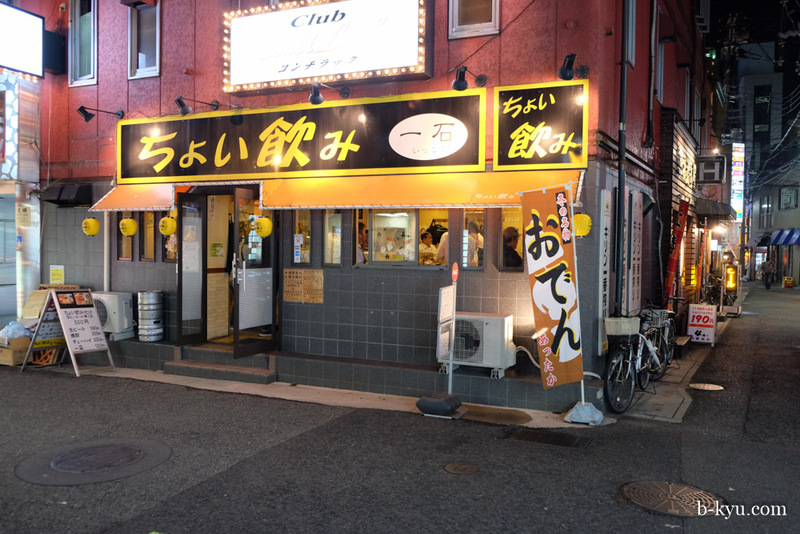 It looks kind of clinical from the outside, but there's signs of drinking inside. Alison is a walking living breathing beer diviner. Somehow we manage to end up in what a regular tells us is the cheapest pub in town and it's happy hour. We must have an instinct for such things. The happy hour system is so good you can place additional orders and then have them delivered when you want them, even if happy hour has finished. 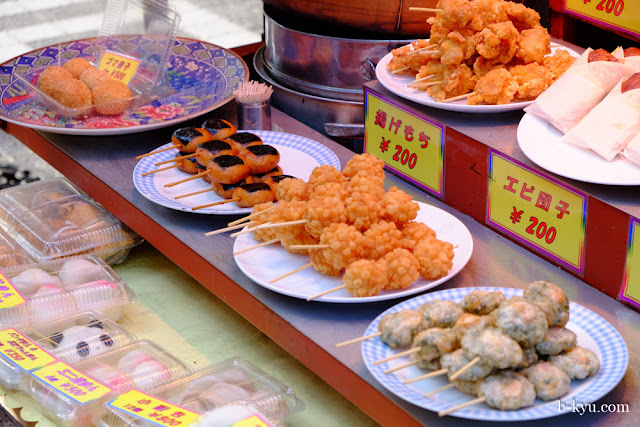 Beer snackies - kushikatsu, or as Shawn likes to call it, fried crap on sticks! 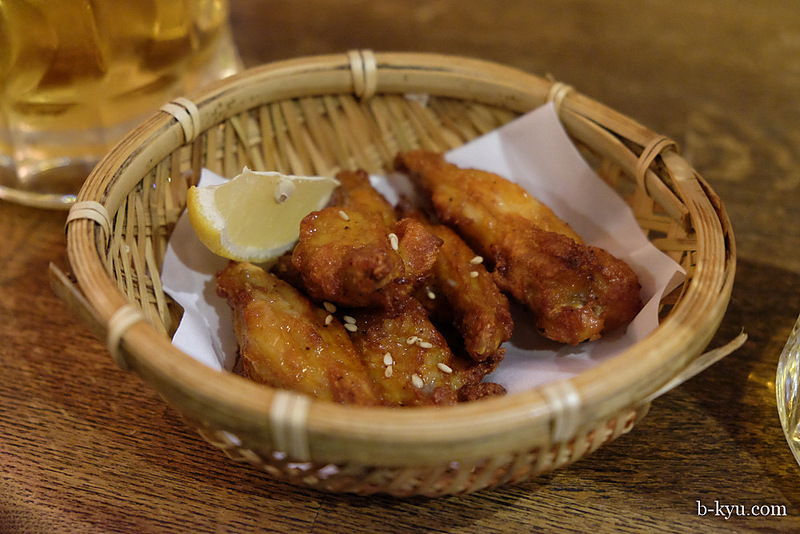 More beer snackies - fried chicken wings, good and crisp and beer soaking worthy. After beers we scour the bar area looking for a restaurant that calls our name. We see a dozen places that look great but they're a little more upmarket and we haven't got the energy to deal with the language barrier. 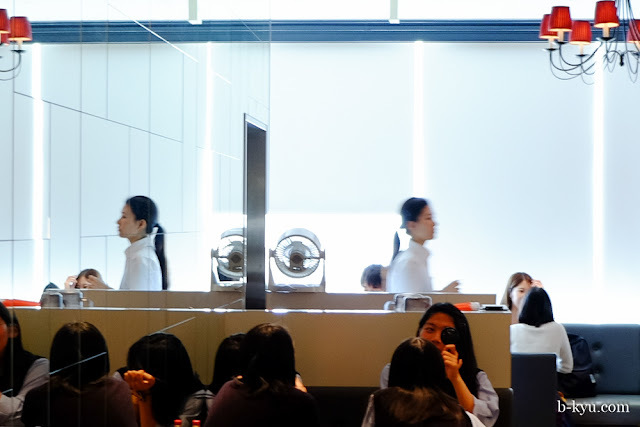 We could do our usual point and smile routine but we have to find a restaurant that is half full so we can get a table and find some fellow diners' plates to point at. 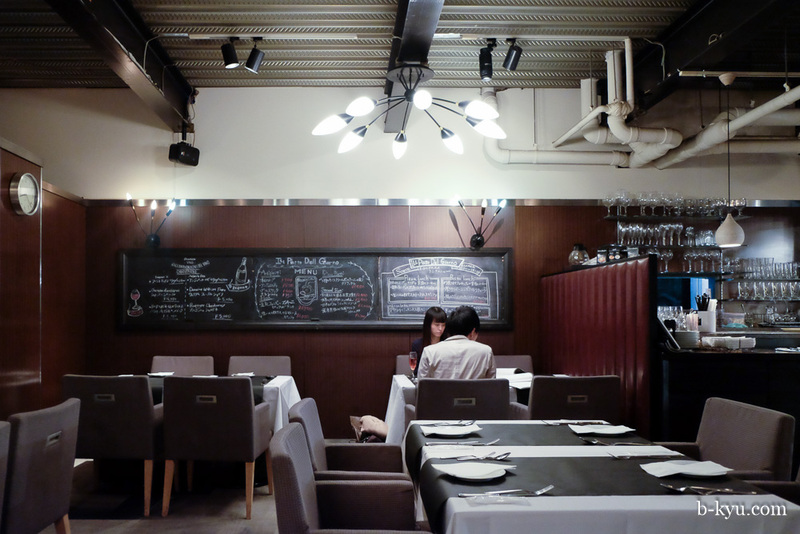 Which is not so easy when most restaurants are tiny, they're either empty or full. 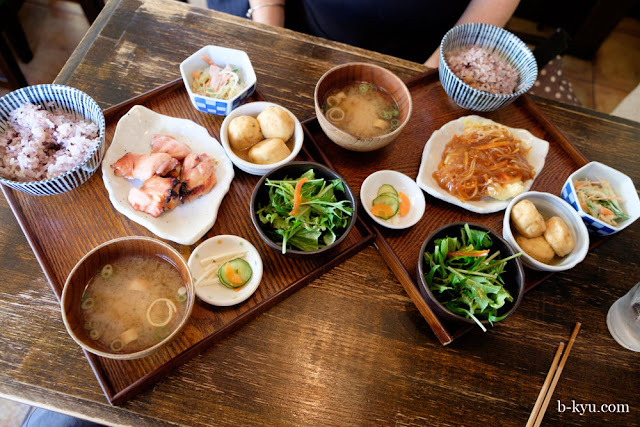 We realise we really have to learn some Japanese if we want to take our eating to the next level. We kind of feel like pizza anyway. Japanese pizza is fantastic. 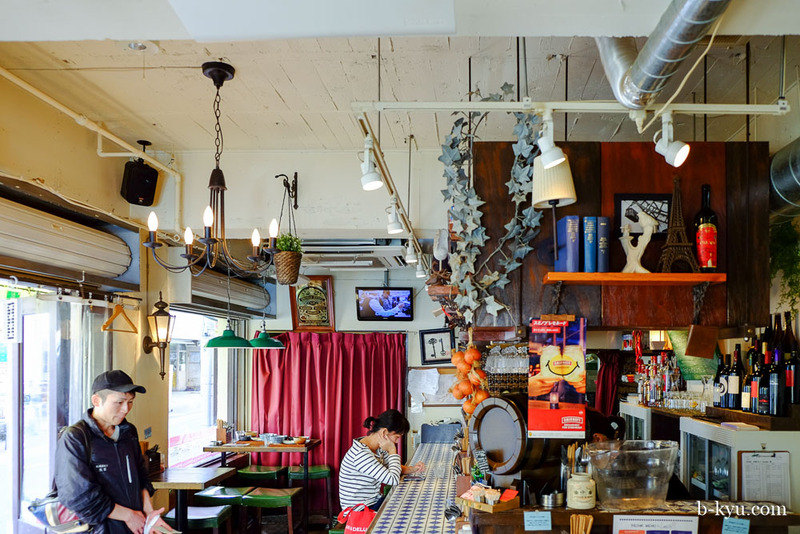 It's super easy to find an Italian restaurant in any large city in Japan, until you really want to find one. We walked all through the bar area then back down to the water near our hotel with no luck. As tears were setting in we asked Google Maps for the nearest Italian restaurant out of desperation. Why didn't we do this in the first place? When overseas Google Maps usually only brings up the crap we don't want: Starbucks and Outback Steakhouse. But this time it came up trumps. 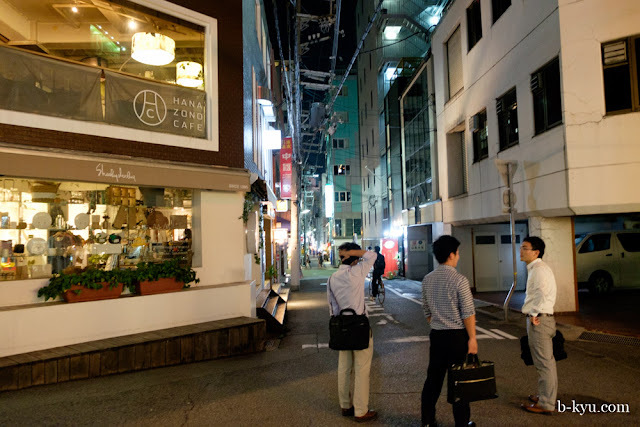 Google brings us to this quiet little Japanese Italian joint. Alison is so hungry she will eat in a place with tablecloths. 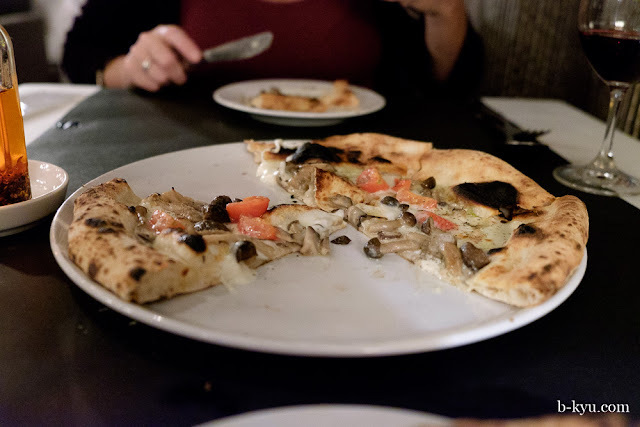 We expected the pizza to be good in sort so slightly kooky, super cheesy kind of way. But no, this is seriously good pizza. There's a wood fired oven out the front and a bloke that has probably devoted his life to learning how to use it. 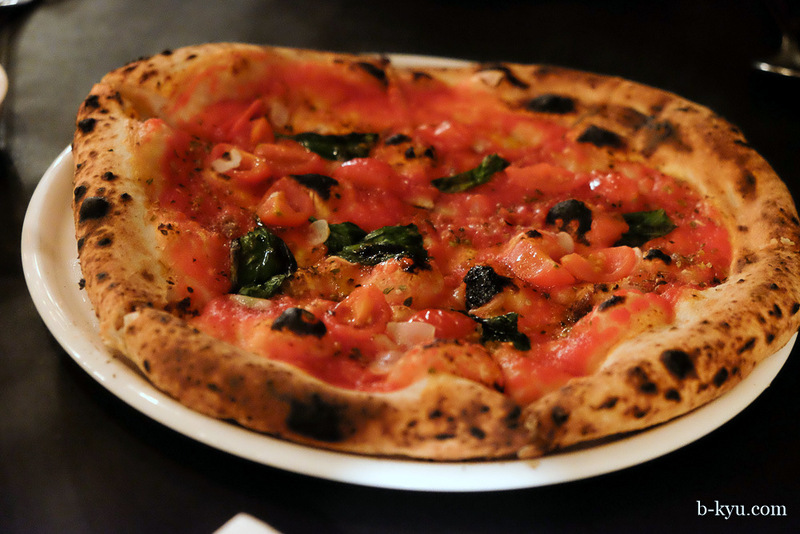 It's that a perfect light base with a simple marinara topping. Perfection. The mushroom pizza uses Asian style mushrooms and oh baby, it works. 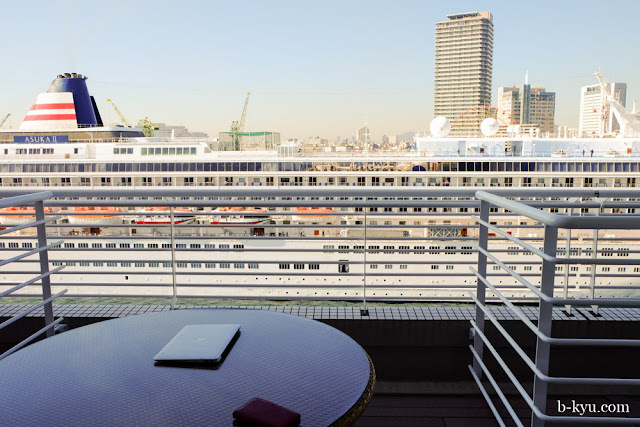 The next day a boat parks outside our hotel balcony. We have a couple of thousand smiley wavy new neighbours. We quickly remove our drying underwear from sight. It's the dreaded last day of the holiday. There's something about leaving Japan that saddens us like no other place. Never figured out why. Our Japanese pizza was so good the night before we crave Japanese spaghetti for lunch. We look for a place that takes their pasta seriously. A joint called Pasta de Pasta sounds about right. 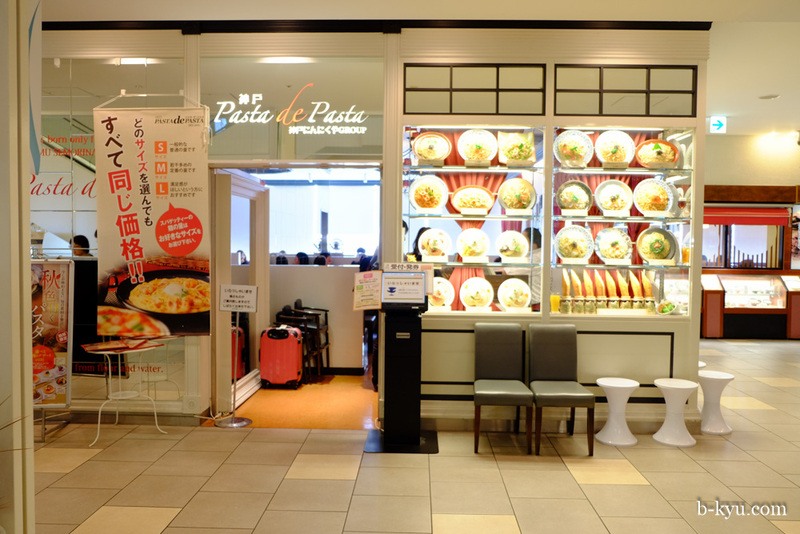 Pasta de Pasta is in one of those super middle class food court\restaurant floors a few stories up in a department store building. Such places are always worth a look, we should do this more often. 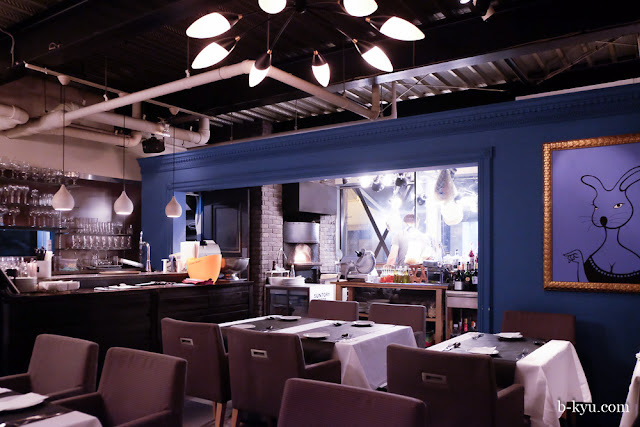 The photo we would have like to have taken here was a long table of prim and proper private school girls in ties and blazers daintily shovelling massive bowls of spaghetti. Just like the pizza the night before, we expected the pasta to be a bit of offbeat fun, a little kooky but super yummy. Well it was super yummy but it was also seriously good al dente pasta. 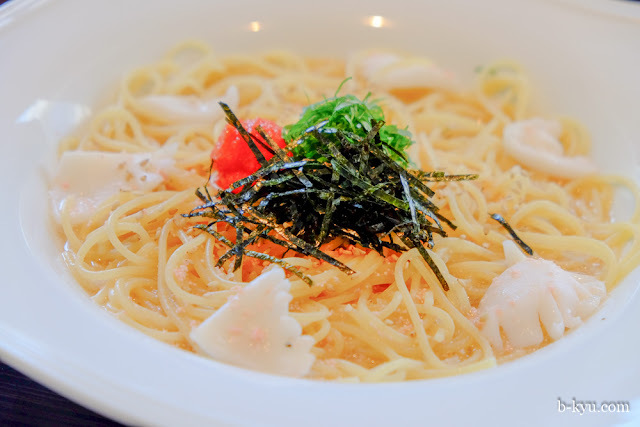 Fish roe and spaghetti are a match made in heaven, it's buttery, salty, umami wonderfulness. 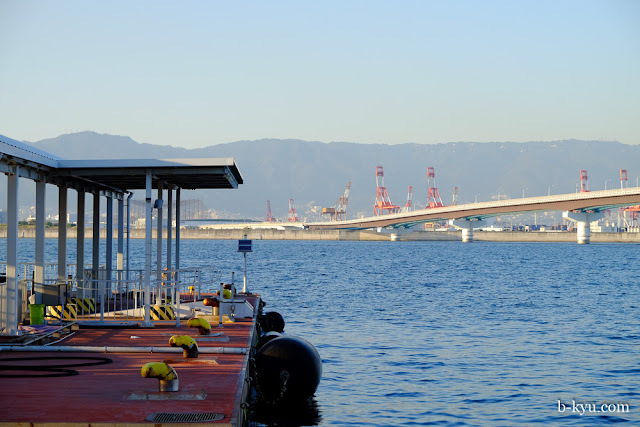 You can get to Osaka Kansai airport from Kobe by boat, it's slower than the train but more fun. 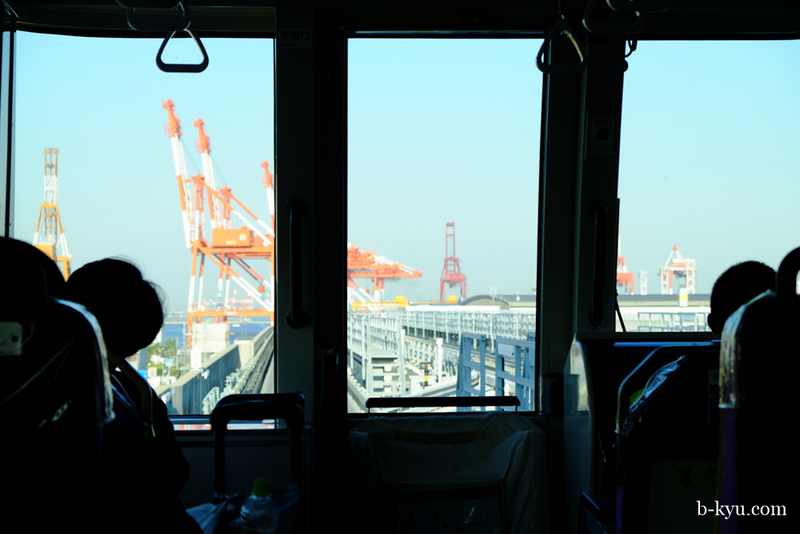 The train trip to the ferry terminal at Kobe Airport is a hoot (you can buy a combined train\boat ticket). Sit up the front of the driverless carriage and you get a trippy futureworld view as the elevated train heads out of the city, past docklands and through new reclaimed land out to the ferry terminal. Looking back to Kobe's mountains and docklands from the ferry terminal. 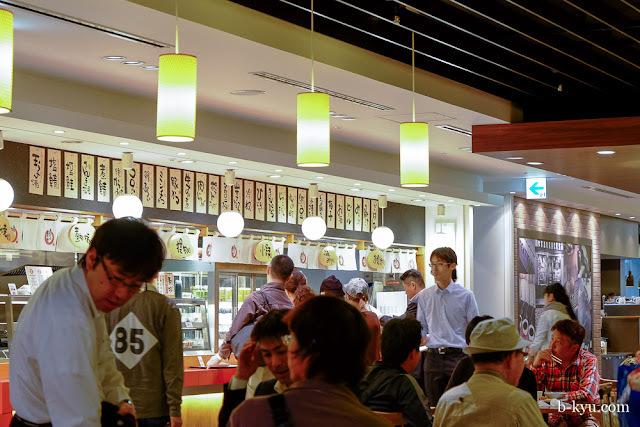 For a feed at Osaka airport our advice is to eat before you go through customs and head down to the domestic departures terminal where they have a pretty good food court and much cheaper beers. Last time we went through the customs curtain there was little if anything but a pot noodle to eat on the other side. Not bad for an airport feed, eh? 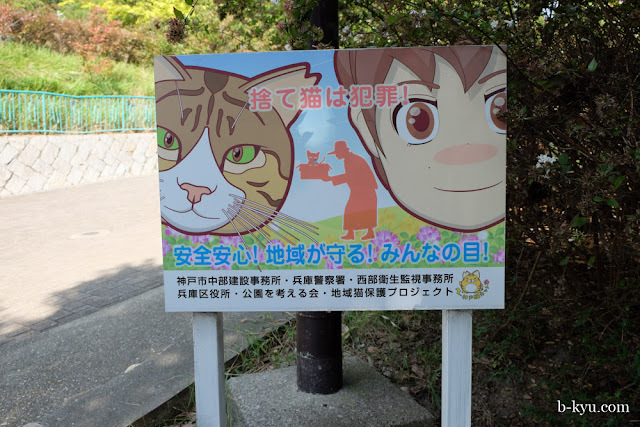 The Kobe and Osaka entries are a delight - so much fun to read. Took you advice last year and went to Taiwan (and Sth Korea). 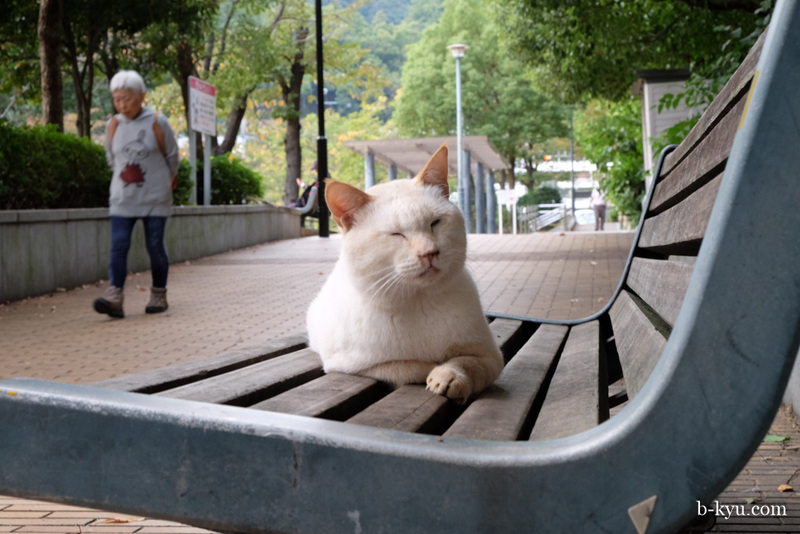 I'm now kicking myself for not catching the ferry and spending a week Osaka. Next time. Thanks Trevor! We are kicking ourselves we haven't spent time in South Korea, hope you loved Taiwan as we did. Yes, that's the one, love the artwork.